Imagine staying at the gorgeous Peace and Plenty Inn St. Augustine Bed and Breakfast and shopping in historic St. Augustine! 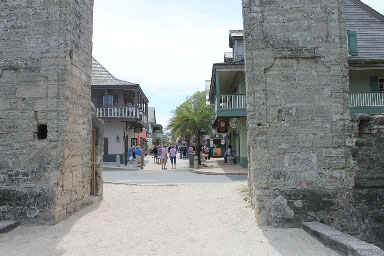 Imagine a sunny day, the streets lined with picturesque historical buildings and lush palm trees. A weathered fort and cemetery are on the horizon, and a costumed Ponce de Leon re enactor walks by. You hear live folk music and smell traditional Spanish fare. The beautiful beach is just minutes away. 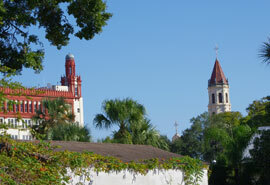 Welcome to America’s Oldest City, St. Augustine. Beautiful handmade jewelry, including nautical themes such as anchors and starfish, and opaque turquoise and rose stones. A little slice of boutique heaven with an Anthropologie feel, they carry everything from lace shorts, to book purses, to statement necklaces. A hip boutique with a decidedly bohemian feel. Consignment and vintage items fill the back half of the store, and clothes by local artists fill the front. Featuring 100% cotton fashion that’s nearly maintenance-free and super comfortable to wear. A colorful boutique with a mission. Go Fish features jewelry, clothes and knick-knacks sourced from under-developed nations with the goal of giving back. All the leather and vegan handbags a girl could want, including some well-known brands. A hip, funky interior decorating store featuring glass art, paintings, mosaics, and silver jewelry from more than 50 artists. Make your own beauty products, fresh to order – you choose the product, and develop your own scent and colors. Unique wood carvings, jewelry and of course shells, that make great souvenirs. You’ll find incense, beads, wind chimes and tons of other little treasures at this earthy shop. Features brands such as J.Crew, Coach, Nike and Calvin Klein. Features brands such as BCBG, Gucci, Kate Spade and Michael Kors. AGOSA (The Art Galleries of St. Augustine) brings together the aesthetics and history of the city into an association of 13 art galleries. On the First Friday of every month you can take advantage of a free trolley that runs between galleries, or pick up a free self-guided tour any day of the week. No matter your shopping style, there are plenty of great finds in St. Augustine. Bring home a bit of historic culture, beach memories, or the latest fashion as your unique souvenir from America’s Oldest City! You'll never forget Nights of Lights in St. Augustine, Florida! It traditionally begins the Saturday before the Thanksgiving holiday and continues until the end of January. The best way to experience Nights of Lights is to plan a stay at the beautiful Peace and Plenty Inn. Soak up all the sparkly, festive atmosphere and enjoy the dining, tours and entertainment this award-winning holiday celebration has to offer. During Nights of Lights, St. Augustine glows with holiday magic - from the ground to the rooftops. Selected by National Geographic in 2011 & 2012 as one of the ten best holiday lighting displays in the world, St. Augustine’s Nights of Lights feature millions of tiny white lights that create a magical atmosphere in the Nation’s oldest city. Whatever your interests, the Nights of Lights festival will not disappoint. From tours of the nation’s oldest city led by costumed storytellers to St. Augustine Trolley Tours that will allow you to see the city in a whole new way, from art displays to free holiday treats and antique shopping to holiday-themed concerts and parades, Nights of Lights will dazzle you. The nation’s oldest city has something to offer everyone. If you want to escape the hustle and bustle of the holiday season or are just looking for a Romantic Getaway Florida or a great place to take the kids, you’ll want to include the Peace and Plenty Inn. We offer the best of modern amenities and historic Old City charm. When you stay with us, you’ll be surrounded by the Nights of Lights celebration, as well as other great St Augustine Attractions that can be explored all year round. Visit our Inn and we’ll show you the most exciting Things to Do in St Augustine, like the St. Augustine Alligator Farm & Zoological Park, the Saint Augustine Amphitheater, the Colonial Spanish Quarter, and the Fountain of Youth Archaeological Park.